Best Goldendoodles matches home-raised, f1b Goldendoodle puppies and mini Goldendoodle puppies with qualified families. Serving Charlotte, NC, Charleston, SC, Raleigh-Durham, Asheville, Jacksonville, Baltimore, Chicago and many NC, SC, GA, FL, VA, TN and MD families. We’re proud to be a part of the prestigious Crockett Doodles network of premium family-raised doodle breeders. F1b Goldendoodle and mini Goldendoodle puppies for well-matched families from the best Goldendoodle breeders. We’ve had Goldendoodles puppies that are caramel, apricot, red, tan, white/cream, and black. Striving to be the best Goldendoodle breeders, our female Goldendoodle and male Standard Poodle are family pets. Read on to find why our puppies are some of the most highly desirable f1b Goldendoodles and mini Goldendoodles in the Southeast. Our occasional litters consistently find homes within hours after we announce them. BestGoldendoodles.com provides F1b Goldendoodles and mini Goldendoodles of outstanding health, temperament, and looks to well-matched families in the Southeast. As best Goldendoodle breeders, we will not ship Goldendoodle or mini Goldendoodle puppies or fly them cargo. We think this provides a terrible start for a puppy. Although we refuse to ship, we will personally hand-deliver Goldendoodle puppies (depending on the location) or allow a Goldendoodle puppy to fly back with its new family if it flies in the passenger compartment. Email Nathan@CrockettDoodles.com to find out the process for obtaining one of our highly coveted puppies. Goldendoodles are excellent dogs, but they’re not right for everyone. Owning a Goldendoodle or mini Goldendoodle puppy takes time and money. If you don’t have the time or the money to invest in a dog (Goldendoodle or otherwise), then you probably shouldn’t be considering one. For someone willing to invest some time and money, Goldendoodles and mini Goldendoodles are a great choice for many people. He continued, “People can get a Lab, a Boxer, or a Doberman if they want. . . but it’s not a Goldendoodle.” He was obviously biased towards Goldendoodles (as am I), but there are several reasons why Goldendoodles and mini Goldendoodles have become the most popular designer dogs and are considered to be the Cadillac of the dog world by some people. Read more about the popularity of Goldendoodles and the desirable traits of Goldendoodles here. Our best Goldendoodle breeders’ philosophy behind Goldendoodle puppies differs from many other breeders’ philosophy. You can read horror stories about puppy mills with dozens of stacked boxes packed with sickly dogs who never see the light of day. Sadly, Goldendoodles, Labradoodles, and other designer dogs are hot commodities for the puppy mills. Fortunately, many states are cracking down on these cruel puppy mills where some owners have become rich off the poor dogs they keep in deplorable conditions. If you see a Goldendoodle puppy, mini Goldendoodle puppy (or any desirable dog breed) for an extremely low price, you should look into it carefully. Often puppy mills ship their dogs through internet purchases for low prices to unsuspecting buyers who never even consider visiting the place they got their puppy from. Be careful not to inadvertently support a puppy mill by having a Goldendoodle shipped to you (I’m not saying any mini Goldendoodle breeder who ships a puppy is a Goldendoodle puppy mill. Some reputable Goldendoodle breeders choose to ship. I just disagree with their choice). Many reputable Goldendoodle puppy breeders rightly condemn the deplorable practices of puppy mills but have 14-18 dogs themselves. When a website lists multiple Doodle “moms” and several Doodle “dads,” you need to ask yourself if these Goldendoodles are really treated as pets. Where would you keep 18 dogs? If you think about it, it is understandable why someone who breeds Goldendoodles for a living would find it necessary to have so many dogs. They need to put food on the table and provide for their family. I also understand why some Goldendoodle and mini Goldendoodle puppy breeders would try to convince you that you need their particular breed. If someone has a Goldendoodle kennel outback with 18 barking dogs, and they have 30-50 puppies available at any time for adoption, of course, they will be desperate to sell you a puppy, and of course you won’t be placed on a Goldendoodle waiting list. Adopting a Goldendoodle from a family with one or two mother Goldendoodles is a great option (or a reputable breeder who uses guardian homes). My wife and I have one medium Goldendoodle mother, one standard poodle father, a mini Goldendoodle and a few other Goldendoodles that we have placed in guardian homes where they are the pets of our friends. Goldendoodles are a passion and hobby for us. We are not full-time Goldendoodle breeders. We have to turn away more families who want pups from us than we can accept, and we do not always have Goldendoodle puppies for sale. Even after a family is accepted by us there is typically a waiting period. Some Doodle puppy breeders with multiple dogs offer great pets, but I personally believe that it’s a good idea to buy from a knowledgeable Goldendoodle owner who owns a couple top-quality dogs and treats them as pets–someone who’s not in the puppy business full-time. I also would be very hesitant to buy a mini Goldendoodle or standard Goldendoodle puppy from someone offering to ship Goldendoodle puppies across the United States. Goldendoodles have become popular enough that it is reasonable to expect that you can find a quality Goldendoodle puppy, with a health guarantee, within driving distance of your home. I’m not a full-time Goldendoodle breeder. I’m a professor at a private Christian liberal arts university (BJU), and my wife is an events coordinator (and primarily a mother). 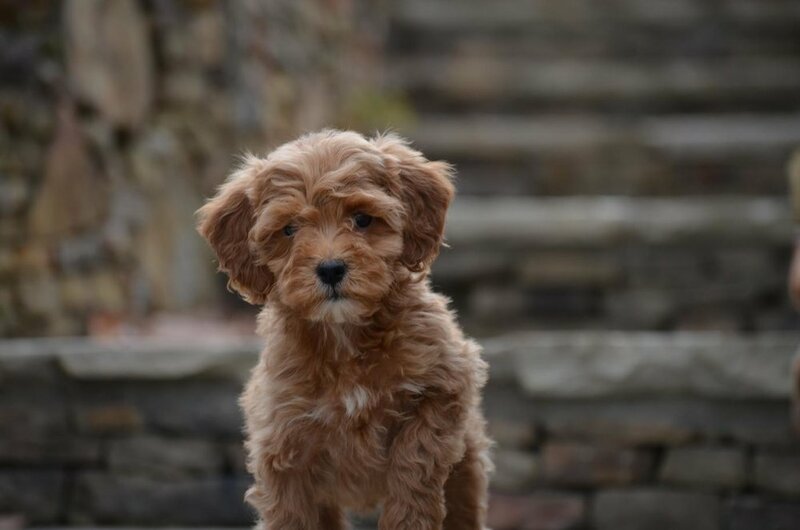 Our goal is to match our standard Goldendoodle puppies and mini Goldendoodle puppies first to our family and friends, though we don’t mind placing Goldendoodles with other well-matched families as puppies are available. Email nathan@crockettdoodles.com for more info about how we match our puppies with the best-fit families. A great dog (Goldendoodle or otherwise) depends largely on nature and nurture. You want a standard Goldendoodle or mini Goldendoodle with the best possible genetic foundation, and you want to provide that Doodle with structure and balanced training. Hopefully the breeder you get a Goldendoodle puppy from has done some homework to help you with the nature part of the equation. As the new Goldendoodle puppy owner, it’s up to you to provide the nurture. We acquired an outstanding Goldendoodle and a great Standard Poodle from totally different breeding lines hoping to provide our Doodle puppies with healthy genetic lines. We are confident enough in the genetic nature of our puppies that we offer a health guarantee. Beyond strong genetic lines, it is also important for you to meet the Goldendoodle (or Poodle) mother and father of your puppy and see if they have desirable temperaments. A Goldendoodle puppy will probably be a lot like its mom and dad. Many people wonder whether or not Goldendoodles are hypoallergenic. Although no type of dog can be guaranteed as completely non-allergenic, the likelihood of a dog irritating someone’s allergies is directly linked to a non-shedding coat. The greatest advantage of a F1b Goldendoodle is its incredibly strong potential for a non-shedding Poodle coat. The non-shedding coats of F1b Goldendoodles and mini Goldendoodles make them highly desirable (compared to F1 Doodles). Although most f1b Goldendoodles do not shed (or shed very little), it is impossible to guarantee that any dog (even Goldendoodles) will not shed at all. If you do your research and determine that a Goldendoodle or mini Goldendoodle is the right match for your family, please contact us to see if we can help match you with the perfect puppy. We offer many “extras” with each of our Goldendoodle puppies. Our desire is for the new Goldendoodle family to have the best experience possible. By helping you get the best possible supplies for your Goldendoodle or mini Goldendoodle puppy, we help make the Goldendoodle’s new home a seamless transition. Although based in the Greenville/Spartanburg area, most of our Goldendoodle families come from Charlotte and Asheville, NC or Charleston and Hilton Head Island, SC. However, it is not unusual for us to have interested Goldendoodle and mini Goldendoodle families from Clemson / Columbia / Myrtle Beach(SC), Raleigh-Durham / Greensboro / Fayetteville / Winston-Salem (NC), Knoxville / Nashville / Memphis (TN), Atlanta / Athens (GA), Lexington / Louisville (KY), Virginia Beach / Richmond / Chesapeake (VA), Jacksonville / Orlando (FL), Chicago (IL), Indianapolis (IN), Baltimore (MD), and Birmingham (AL). We’re always surprised when Goldendoodle families contact us from Los Angeles, NYC, St. Louis, Detroit, Milwaukee, Philadelphia, Boston, Baltimore, Houston, and Phoenix. We absolutely never ship Goldendoodle or mini Goldendoodle puppies, as we think that provides a terrible start for a puppy. The commitment of families to travel from all over the U.S. to our Greenville, SC, location shows us the quality of family that we match our occasional puppies with. We appreciate families that understand that a Goldendoodle puppy is a multi-year (hopefully 15 or so) commitment, and worth some effort. If you are interested in the variety of Goldendoodle colors, you can read a discussion and see many pictures of Goldendoodle colors here. If you just came looking for pictures of really cute Goldendoodle puppies, look at the photo books of our previous puppies (see the menu options below). If you’re looking for information, rather than a Goldendoodle puppy, I’d encourage you to check out what I’ve written at www.theLabradoodle.com.